There is a space where we are able to bind up the breaking and close up a wounded soul. A sacred holy kind of living that exists in the midst of one whose heart is full of compassion and gentleness. I can think of many such individuals in my lifetime that have exemplified these traits, real people… humble people…transparent people…grateful people. 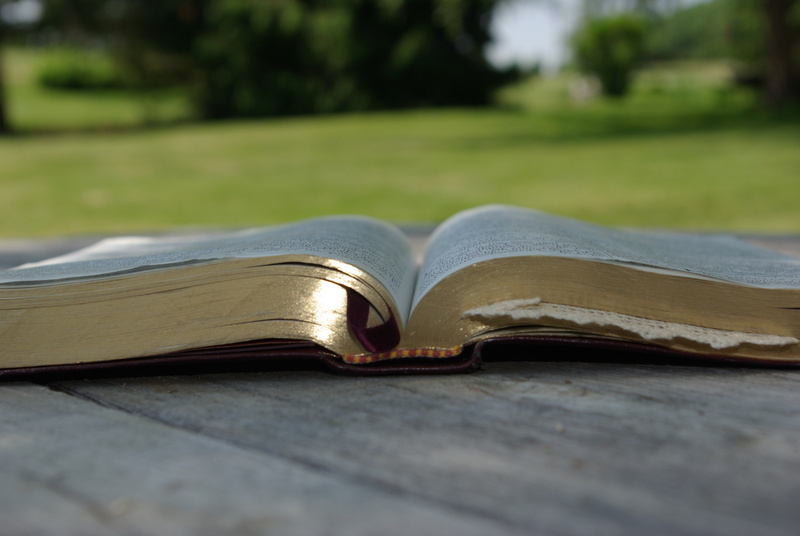 I am drawn to the transparency of a deep and abiding love for God and for others. It reminds me of Jesus. It is a welcoming and wholesome heart that exists to invite others in because they know that there is more to life than collecting things and experiences and applause. And lately I have been thinking about the power of this kind of life. The one that doesn’t close doors or exclude others. The one that in gentle surrender takes the hand of the weeping heart and places grace over the breaking space of a weary one. 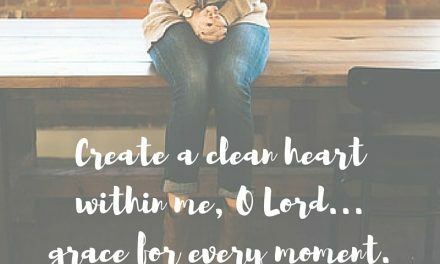 The kind of grace and gratefulness in the surrendered heart makes space for others. It is what Christ did. It is what He asks us to do. And I wonder what it would look like if we let grace win the wars we fight? Perhaps we would remember there are people on the other side of our words, there are beating hearts that need a little bit of compassion and a generous dose mercy…just.like.us. 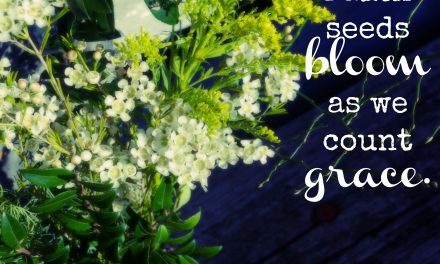 Too often, we get caught up in being so close to those that ‘get us’, that see the way we do, that agree with us…that we miss the beautiful example to bleed grace in the lives of those who are in need of a blood transfusion of hope. Oh, heaven help us, friends… if all that we do is surround ourselves with only those that agree with us. But there is a way to let our hearts find this space of transparent love, grace and gratitude with a great big helping of love. It’s so simple that we miss it. One of my favorite places to settle and wait, is right around a table. Wood pierced with nails and stained to hold whatever is laid out. Like people who wear garments of grace as a mantle of truth, I am drawn to the simple unity a table provides. It is a place for grace to multiply, for a manifestation of His gifts to be spilled out, for truth to be distributed, and for hope to grow. The table is the space where we can lay out all that we have… to cover it fully with the abundance we have, good and bad, and still it is strong enough to bear it up. It may get cluttered, it may be messy, it may get scratched and stained and scarred, but a good table….a solid table…a crafted table will withstand even when the load is heavy. Even when it is loaded down, it still provides a welcome. It is still a space for communion and fellowship and prayer and blessing. Because we live around the table, friends. It is a place to gather, to grow, to challenge, and to weep. Like a witness it becomes a collector of our #GraceMoments, reminding us that life is about living the real, the whole, the transparent mess that makes days add up into months and years and decades. It is an open invitation to do life together. I have been pondering the power of the safe places we provide for our families, for our friends, and even for those we don’t yet call known to us. These seats that are pushed up close to our tables and our welcome spaces. Because, honestly, I want more. I don’t want to be found only catering to the people I am comfortable with, those I know are safe and easy. I want to extend grace, to pour out lavishly the blessing that sitting together provides. And it occurred to me that even in our difficulties, especially in our differences, this is the space that unites and builds hope because it connects hearts. 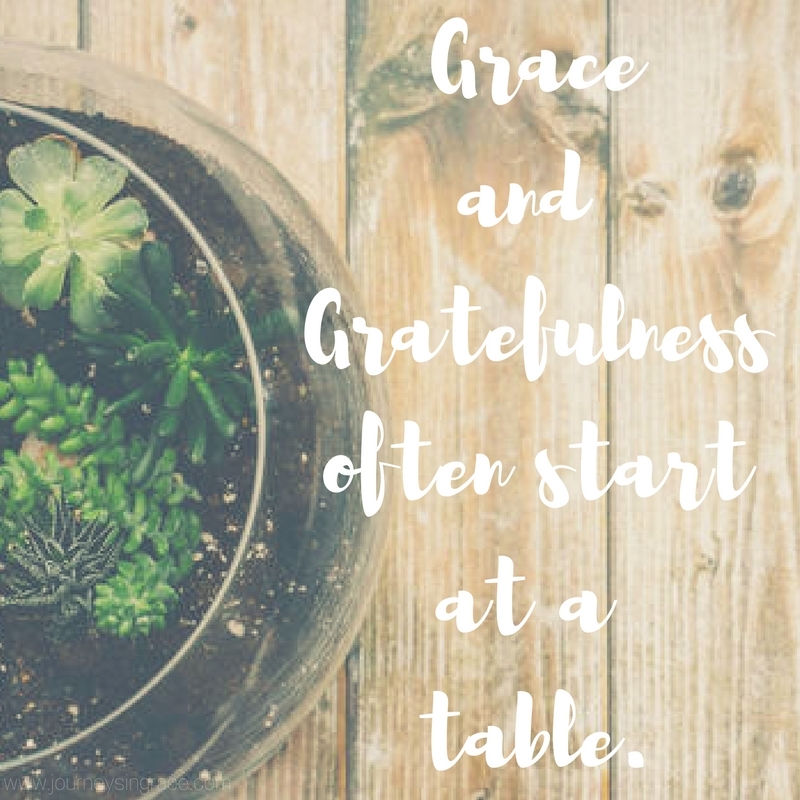 When grace looks like a table of gratefulness… there is safety for all who settle close around it. My table is forever one of my favorite places to sit and be. Here in the central room of my house it is usually the first place I invite people to rest. It is the beginning of many conversations and the location of many decisions in our lives. This table is a safe place for our kids to find us and to sort out those things that make their hearts beat strong. It is a nourishing space where meals are blessed and were heads are bowed together, because there is a waiting for His goodness and an invitation for Him to draw near. Words are spun at this table and lessons are dictated repeatedly. Hard words and grace words mingle one next to another because it is life and we are human, imperfect vessels seeking purpose and service in tandem. And here at the table is the start of this gratitude of the heart. A gratefulness for the turbulence and the ceremony, for the beauty and the pain, for the abundance and for the lack, for the filling and the longing. As I consider why it matters so much, I remember the communion of the bread and the cup… the partaking of Holy gratitude which took place at a table. When His body was broken as a symbol for us, the wretched and sinful were given a promise and when His blood was poured and divided as a drink offering. This remembering we do, a meal of sacred grace, witnessed continually through the ages… demonstrates an act of gathering and partaking together. And we count out the blessings with grateful hearts. And we thank God for His goodness and for His mercy. Because at the table we remember gratitude is the key. I am firmly convinced this is the way of love to others well, to feed them love. To serve them grace. The way of serving and of giving them the space to be, to exist , and to know they are loved. I am becoming progressively more aware of the gentle blessing He provides in the art of a meal and the invitation of acceptance. And this week, my heart tears for the words of division and the way that people are choosing anything but grace. But I was reminded of the lesson I learned with my kids. As we sat around a table , talking about the hard real junk that is a part of our world I remembered that I need to collect these moments of gratefulness when I am looking for grace. So many of the moments I catch, collect and record are here at my table. And there is a blessing in making this space holy and sacred for Him. 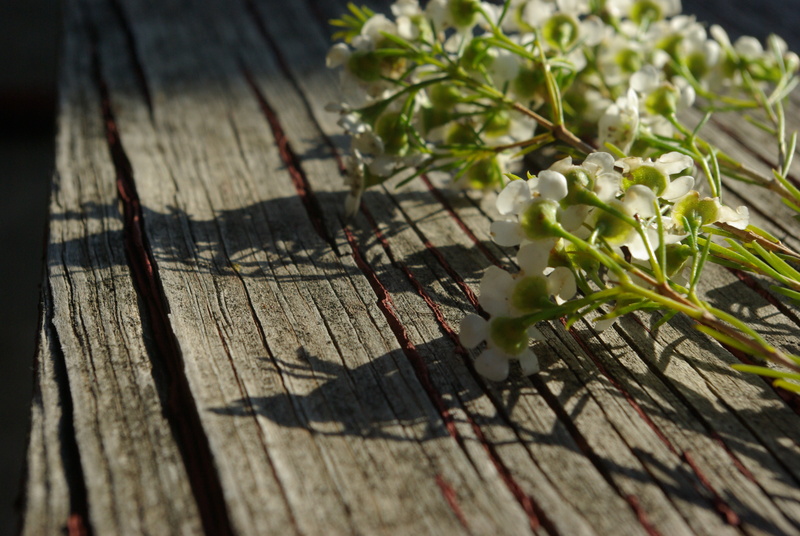 You are invited to sit here with me, to join hands, and to give thanks together…to spill love on to the table of our lives together even when we don’t agree on issues we can agree to rest together at the table and lay out grace. 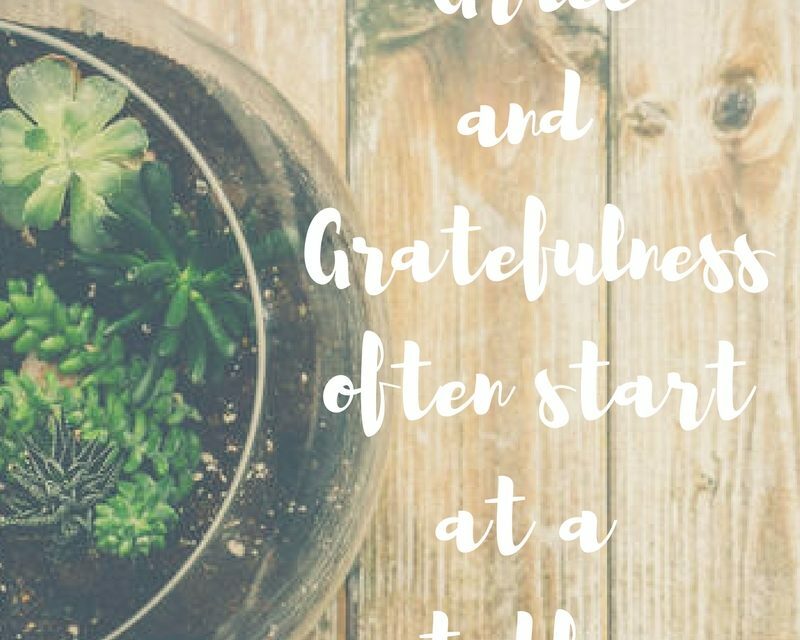 Will you come this month, to the #GraceMoments Link up and share what you are grateful for? Will you remember with me why it is important to keep that door of mercy swung wide open? I am grateful for you, for this table that He has provided both literally and figuratively to share with you. I think of my table as my command post — I can see clearly the entire downstairs of the house, and monitor whatever’s going on while I read or study or “watch and pray.” The table is also the gathering place for all the chaos and the love and the food and the laughter that happens in this crazy house. I loved reading your reflections on what your table means to you! A good reminder and sometimes so hard to do. Loved this –> there is more to life than collecting things and experiences and applause. Thank you for the beautiful reminder of simplicity and grace this morning. Oh how fun it would be to gather around your table for coffee and a chat…maybe someday! Until then, we will continue to share our words with one another, trusting that God can use even one far away to minister grace and truth to our hearts. A beautiful post! Praying that we all would think about our tables…. “Because at the table we remember gratitude is the key.” Praying for our tables to be filled with much gratitude every day. Blessings!